Get that classy look at a competitive price.. The most well known and leading advantage that a high quality engineered wood flooring has over any solid wood floor, is its stability. Thanks to the way in which engineered wood flooring is structured, with a hardwood multiply core, they are far less prone to movement. Traditional solid wood flooring is a completely natural product that reacts to varying moisture and humidity levels. Timber is a semi-porous material that is prone to swelling and shrinking, most commonly across its width. This can result in either gaps between boards or even the floor buckling if out swells its expansion gap. Our engineered oak flooring is the most stable type of wood flooring on the market and the chances of getting any serious movement are minimal. Because of this, it means it can be laid into environments that traditional solid wood floors would not be able to cope with. Conservatories, kitchens, bathrooms and floors with underfloor heating are all areas where solid oak would not be advised. Whereas nowadays, with a high specification engineered wooded flooring such as we supply, oak flooring can be enjoyed in these environments. The reason why people love wood as a choice of flooring material is largely down to its timeless natural beauty that it can bring to traditional and contemporary properties alike. Many people are originally unaware that the wood that is used for the top visible surface of our engineered wood flooring is the same high quality timber that would be used on any of our solid wood flooring. This means that visually the floor looks just as attractive in appearance. 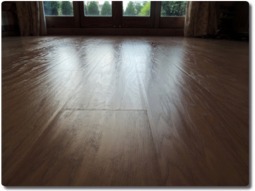 Not only do engineered wood flooring look the part, they will also last as long too. The final advantage is the environmental benefits that engineered wood flooring offers. The ply wood that is used within our boards is made up of a mixture of faster growing and less valuable timbers. With engineered wood flooring, the majority of the board is made up of ply, and therefore less of the valued hardwood that has taken hundreds of years to grow is used. Copyright © Click Flooring 2013 - All Rights Reserved.